What kind of climate change? Probably global warming, but they don’t actually say so. Global warming ended about 17 years ago. Global warming propaganda suffered a devastating blow in November 2009 when hackers released emails from the UK’s Climate Research Unit. These emails revealed the depths of deception on the global warming issue. These emails turned the subsequent Copenhagen meeting on global warming into a big joke and the movement has never recovered. Now propagandists rely on the phrase “climate change” to try and deflect attention from the fact that there is basically no evidence for global warming. Back in 1975, scientists blamed heavy rain and flooding on global cooling. So who knows? In any case, it is unlikely that the epic Alberta floods have any connection whatsoever to “climate change”. Downtown Calgary is built right between two rivers — we’re lucky this kind of thing doesn’t happen more often. CALGARY (June 1897) Bow River rises about five metres turning downtown into a lake, washing out bridges, short-circuiting electricity and cutting Canadian Pacific’s line to Vancouver. CALGARY (June 1915) The Bow washes away Centre Street Bridge, nearly drowning two city officials. Sheep Creek floods Okotoks and cuts gas mains, leaving Calgarians without cooking fuel. CALGARY (June 1923) The Elbow River breaks the 1915 record by 20 centimetres when it rises to 2.9 metres. The Bow River, though it rises 1.5 metres above normal, is still about .6 metres under the 1915 record height. CALGARY (June 1929) Bow, Elbow and Highwood rivers overflow to submerge High River as well as southwest and northwest city districts under a metre of muddy water. It takes a heavy toll on zoo animals. CALGARY (June 1932) On June 1, 1932, Calgary receives 79.2 mm over a 24-hour period, just .6 mm less than the average rainfall for the whole month. The empty reservoir of the recently completed Glenmore Dam prevents major damage. HIGH RIVER (May 1942) The town lies under two metres of water after rains swell the Highwood River, forcing evacuation of homes. And here is a picture of the 1932 Calgary flood. Looks a bit familiar, doesn’t it (note the water level relative to the Centre Street bridge)? 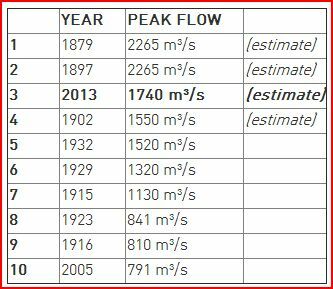 UPDATE: A crushing blow to the climate change propagandists: We are informed by the Weather Network that before the 2013 flood, the eight worst recorded floods in Alberta history occurred before 1933. In 1879 and 1897, the floods were about 35% worse.